Walmart. Kmart. Kwikie-Mart. Their names contain a tantalising hint  but none has actually delivered. Until now. At last, the greatest (waistline included) reformer of all time gets a taste of gadget glory. The original lager-swilling Prot (without whom, etc. etc.) shakes his head in admonition. But what of? Working women, of course, who "have but small and narrow chests, and broad hips, to the end that they should remain at home, sit still, keep house, and bear and bring up children." 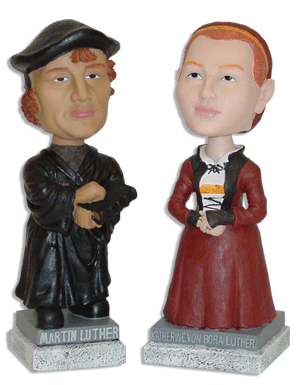 Not like the Great Man's wife, Katie, also pictured here in bobblehead form. More of Germany's finest in ex-cathedra mode can be found here. His hand-painted doll, meanwhile, weighs in at 1 pound 7 ounces and costs just $14.95 from the Old Lutheran, where you can also pick up a bottle or two of Sin Boldly beer. Hearty thanks to shipmate Teresa Nielsen Hayden who nailed this gadget to the captain's door.